They are pulling the plug out on both their hosted and on-premises PBX systems, which means you need a new option for your business phone system. If you find yourself as one of the unlucky businesses who has had their feet swept out from under themselves by this, don’t worry. Since you have already moved to the Cloud, the transition to another Hosted VoIP provider will be much easier than those who have Toshiba’s on-premises IP PBX system. Now that you’re in the market for a new Hosted Business Phone System, we should go over a few things that you need to consider before choosing your next Hosted VoIP provider. These are six of the most important things for you to consider when you’re looking for your new provider. If you have an on-premises IP PBX System from Toshiba, you may be in panic mode right now. Don’t worry, there are several options that exist that might ease your mind on the situation. This is obviously less than ideal due to Toshiba’s downward slide overall. But, the undoing of a 150-year-old company is going to take much longer than the life of your IP PBX. The average on-premises PBX business phone system is about 5 years. It is very likely that you’ll go those five years without any problems. If you experience problems, you probably should upgrade and look for a new system or you’ll have to rely on your warranty. You probably haven’t heard of SIP Trunking before, but it is a viable option for those who just recently got an IP PBX from Toshiba. When an immediate change to a different provider or to a Hosted VoIP provider is impractical or impossible, SIP Trunking can be a solution to help you get more out of your system. It can be complex and isn’t an ideal situation, but basically, it allows for a cloud-based phone provider to add users to your PBX virtually. Though you will still have to deal with the actual hardware, SIP Trunking can give you some flexibility with adding people to your system without having to upgrade, which isn’t an option now if you’re using a Toshiba PBX system. We know that spending thousands of dollars on a business phone system and then just switching to a cloud solution might not be realistic, but if your system is about due for an upgrade then it might be your top consideration to make the jump to a Hosted VoIP solution. It is cheaper and more versatile than an on-premises system. You will no longer be limited by your hardware and you’ll be paying much less for your phone service. It really is the best of both worlds. Moving to the cloud is going to be the best option for businesses in the long run. And as we predicted in 2017, we have already seen a lot of consolidation happening in the UCaaS market. 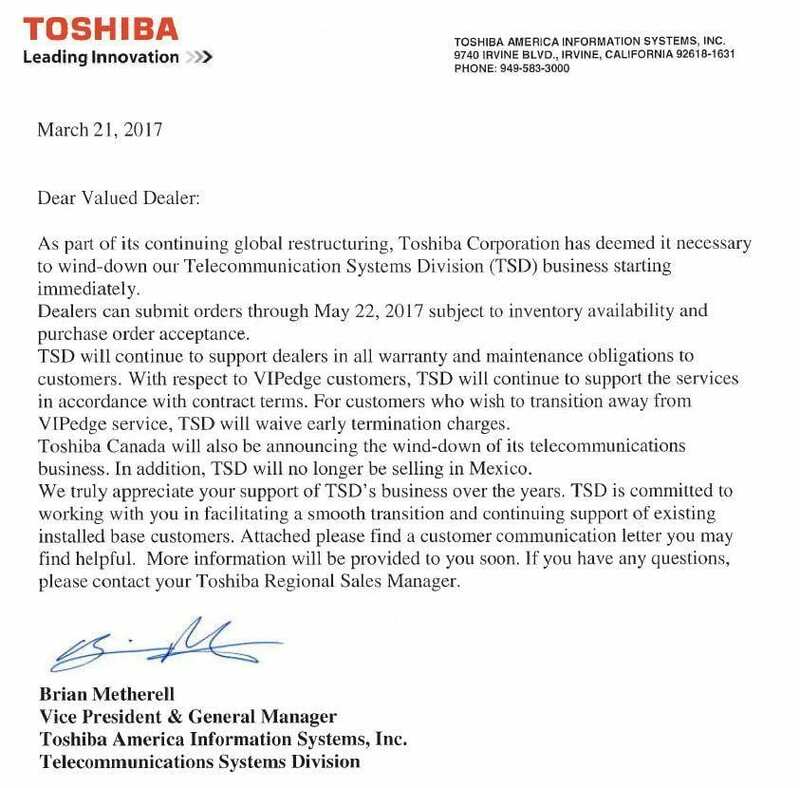 This move by Toshiba proves that more movement in Unified Communications will occur in the near future. Businesses need to look for stable service providers, like Jive, who lead the industry and specialize in Hosted VoIP. These solutions offer businesses more features than traditional phone systems. Jive offers more than 80 features for businesses with Jive Voice—our Hosted VoIP product. This allows for your business to receive the enterprise-grade phone system that it needs without having to worry about expensive hardware, extra storage space, and licensing fees. Jive Voice also integrates well with many different CRMs and software that you already use. Finally, Jive offers all of its services for a flat rate. No a la carte pricing for voicemail boxes, auto attendants, or conference bridges, with Jive you get unlimited features for the same price. This allows you to use your phone system as an effective tool to run your business. If you’re interested in learning more about the difference between a Hosted and On-premises business phone system, read more about it in our Why Voice in the Cloud whitepaper.